April 2014 – Welcome to Wyandotte Daily! A woman who was shot at 7:41 a.m. April 28 at 51st and Leavenworth Road and who died April 30 has been identified as Adoria M. Verser, 29, of Kansas City, Kan., police said today. Police have identified the man who suffered a self-inflicted gunshot wound at the scene as Shefrin T. Smith, 27, of Kansas City, Kan.
Officers had received a call about 7:41 a.m. April 28 about a shooting at the location. The shooting was a domestic case, police said. A spokesman for the Kansas City, Kan., Police Department said that residents living in abusive situations should seek assistance either through their local Police Department or any other agency that offers assistance for domestic violence. Kansas Crisis line, 888-END-ABUSE (2287). The 4th annual Kansas City Jazz Summit at Kansas City Kansas Community College welcomed 54 bands and crowned a new winner of the Basically Basie competition. 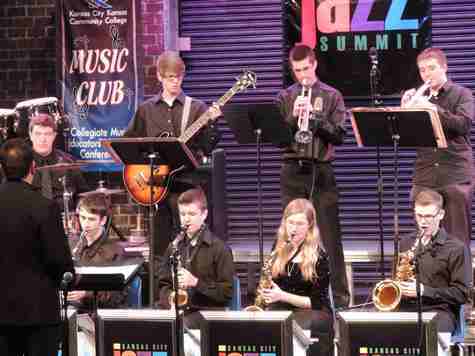 The summit, which was April 23, 24 and 25 in the KCKCC Performing Arts Center, caters to jazz groups at the middle school, high school and college level in both competitive and non-competitive sessions. This includes bands, choirs and combos. • Jazz Summit. A non-competitive group where jazz groups perform for adjudicators. No winners are named, but outstanding groups and soloists are recognized. Groups that participate in this category receive a plaque or trophy. • Kansas City Jazz Heritage – “Basically Basie.” This is a competitive category on Thursday of the Jazz Summit. Groups are required to pick three songs from an established list of Count Basie repertoire. These selections must have been recorded by the Count Basie Orchestra. Judging is based on the authenticity and attention to detail. The top two groups will compete for audience voting, which is done by text message. The winning group receives a traveling plaque. • Jazz Tyro. This is specifically designed for younger bands with little experience. Those that participate receive positive comments as well as a clinic following their performance. The winner of this year’s Basically Basie competition was Roosevelt High School from Sioux Falls, S.D. The last three years, Blue Valley Northwest has received the top prize. Local schools who attended the Jazz Summit include Piper, Basehor-Linwood, Turner, Lansing, Tonganoxie, Shawnee Mission East, Blue Valley Northwest, Olathe Northwest, Olathe North, Shawnee Mission Northwest and Johnson County Community College. The KCKCC Jazz Ensemble, KCKCC Jazz Combo and KCKCC Standard Jazz Choir also performed. For more information about the Kansas City Jazz Summit, contact Jim Mair at kcjazz@kckcc.edu or by phone at 913-288-7503. Two students from Wyandotte County were honored recently at the School of Business awards celebration at Emporia State University. • Bruce VanCleave of Edwardsville, Kan., was named a senior honor student and a distinguished business scholar. • Jinhyuk Yang of Kansas City, Kan., was named a senior honor student. Student who were honored had a 3.5 or better cumulative grade point average.